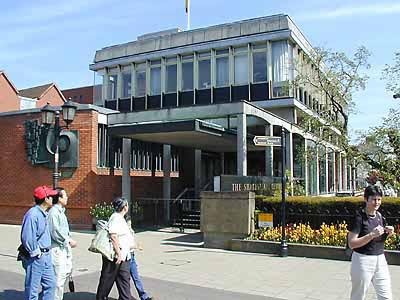 The libraries were founded in the last half of the 19th century and were amalgamated in 1964 when they were housed in the purpose-built Shakespeare Centre. They hold collections covering all aspects of Will Shakespeare's life, works and times and include original editions of his plays dating from 1623. Some of the earliest printed English books are housed here. Containing a major part of the Shakespeare Centre collections containing archival records of every RSC production in London, on tour at home and abroad as well as in Stratford-upon-Avon. Includes manuscripts, programmes, prompt books, music, designs and photographs. Fine photographic records of the Shakespeare Memorial Theatre's and Royal Shakespeare Company's Stratford-upon-Avon productions from 1852-1991. Books, pamphlets, films, sound records and video recordings covering all of Will Shakespeare's plays and includes the complete BBC TV Shakespeare series (1978-1985). Houses important local history collections - printed and manuscript, relating to Stratford-upon-Avon and south Warwickshire. The Shakespeare Birthplace Trust cares for the world's largest collection of Shakespeare related material accessible by the public. Situated in the centre of Shakespeare's hometown of Stratford-upon-Avon, our Collections have been designated as being of international importance. Printed materials and books relating to Shakespeare�s works life and times, including translations of the plays into over 80 languages. Within our library collection we look after three First Folios and a range of important early printed books, which inspired Shakespeare�s genius. Material relating to Stratford-upon-Avon and South Warwickshire, with records as far back as the twelfth century and a number of handwritten documents referring to William Shakespeare from his own lifetime. We also have copies of the Stratford Herald dating back to 1861 (microfilm / bound volumes). Over 11,000 objects, which give an insight into the material world that Shakespeare and his family would have experienced, as well as a record of how his life and works have inspired art and tourism over the past few centuries. Photographs, programmes, designs and production records covering the history of the RSC and its predecessor, the Shakespeare Memorial Theatre, from 1879 to the present. The theatre's collection also includes a wealth of pre-twentieth century theatre ephemera relating to London and other regional theatres, including the Bram Stoker Collection. Whether you are studying Shakespeare, interested in performance history or researching your family history, the Shakespeare Birthplace Trust provides a Reading Room which is open to everyone and free of charge. Every year we welcome readers and groups from all over the world who access books, maps, archival documents, newspapers, performance photographs, videos of Shakespeare productions and much more. It is possible to arrange access to the collections outside normal opening hours, with plenty of notice. We will be providing a Reading Room service from 10am-4.30pm on Monday 22nd and Tuesday 23rd of December 2014 and will then close for Christmas and New Year, re-opening and resuming our normal opening hours on Friday 2nd January 2015. If you would like your items to be ready for your arrival, please email us at scla@shakespeare.org.uk".